Rejuvenate your bed with cloud-like comfort. 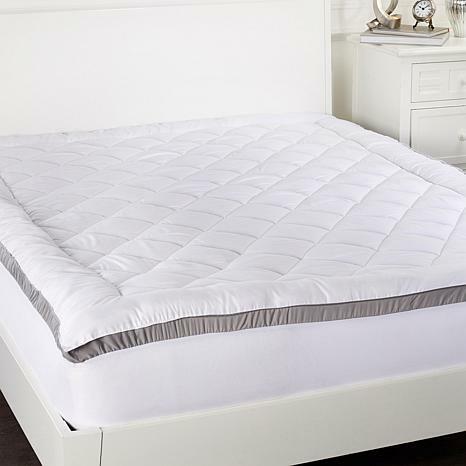 Composed of soft microfiber, this water- and stain-repellent mattress topper is the perfect sleep surface for all. Drift off without worry as it cradles your body in comfort. Don't just dream of better sleep — get it. Fill Weight: Twin - Approx. 36 oz. Full - Approx. 50 oz. Queen - Approx. 59 oz. King - Approx. 77 oz. California King - Approx. 74 oz. Love this! Made my old mattress feel new again! 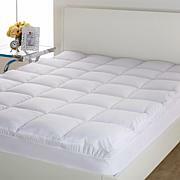 Wonderful Mattress Topper. Fits the mattress perfectly and also helps makes the mattress comfortable. Love this mattress topper. Would purchase again if needed. Getting a good nights rest shouldn't be so convoluted! Or should it? This cool blue memory foam topper may have you thinking again with its classic convoluted texture and ventilated core. Cooler and comfier ... that's not so hard to figure out after all!